Fat chance it'll ever be built. We’re just a couple of weeks away from one of the most exclusive events in the auto industry, the annual Pebble Beach Concours d’Elegance. Not only are some of the most sought after and special cars put on display, but there’s also a rare and classic car auction that brings in tens of millions of dollars. On top of that, automakers sometimes have reveals of their own, both concepts and production models. This year, Infiniti has decided to unveil an extremely unique concept of its own, and we highly doubt it’ll ever make production. It’s described as a "heritage inspired prototype vehicle that captures the ingenuity and adventure of early motorsports." Or, in other words, an early Formula 1 car, although it’s been infused with Infiniti’s "Powerful Elegance" design language. The brand’s design director, the always sharply dressed Alfonso Albaisa (whose work includes the Q60 Project Black S Concept) says that the very idea for his latest concept “started as a simple thought: What if we found a car, down at the southern tip of Japan, buried deep in the bush, hidden from all eyes for 70 years? 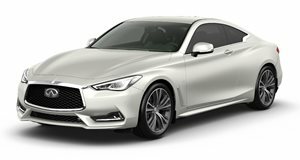 What if in this car we found the seed of passion planted during our first Japanese Grand Prix and the power and artistry of Infiniti today? What would this discovery look like?" Definitely an unusual combination of ideas and situation, but hey, at least it’s creative. Only two teaser images have been released so far. The first showing the concept from the front, open and fully exposed old school F1 car wheel design and all. The second is, of course, another classic F1 throwback, of a helmet and racing goggles placed on the hood in front of the narrow windscreen. Notice the exposed screws bolting a piece of metal into place. While we don’t expect Infiniti to start its own F1 vintage racing program, it’s still cool to see a brand doing something different. Full details coming soon.